The University of Georgia’s Skidaway Marine Science Day, scheduled for Oct. 22, has been canceled. The UGA Aquarium reopened over the weekend, however the Jay Wolf Nature Trail remains closed as crews continue to remove debris brought on by Hurricane Matthew. Both Clark Alexander, interim director of UGA Skidaway Institute of Oceanography, and Mark Risse, director of UGA Marine Extension and Georgia Sea Grant, had hoped to reschedule the event, but no other date was available this fall. Skidaway Marine Science Day has been an annual event on the Skidaway campus since 2001. The free, family-oriented program is presented jointly by the UGA Skidaway Institute, UGA Marine Extension and Georgia Sea Grant, and Gray’s Reef National Marine Sanctuary. Images such as the Great Pacific Garbage Patch have attracted much attention to the problem of large-size marine debris, but another serious issue has garnered less visibility—marine microplastics. University of Georgia Skidaway Institute of Oceanography scientists Jay Brandes and Thais Bittar and UGA Marine Extension educator Dodie Sanders are hoping to change that and have received funding from Georgia Sea Grant to examine the extent of the microplastics problem along the Georgia coast. Microplastics are particles smaller than five millimeters in size (about one fifth of an inch). They have many sources, from manufactured particles like microbeads used in cosmetics and skin cleaning creams to plastic pieces formed from the breakdown of larger debris. Microplastics are often consumed by marine organisms and may cause them significant harm. Until now, there has been no study on the possible extent of microplastic pollution in Georgia estuarine waters and the organisms that live there. The project has three primary goals: The researchers will quantify the amount of plastics found in the gut contents of shellfish, fish and shrimp; determine the types of plastic pollution ingested by Georgia estuarine organisms; and educate stakeholders, the public, educators and their students about the issue of microplastic pollution. The research team will collect marine organisms through the trawls routinely conducted by UGA Marine Extension and will separate, identify and measure the microplastics they find in the fish. As a part of its regular K-12 educational programs, Marine Extension conducts nearly 60 trawls annually and collects fish, shrimp and other organisms to assess the composition and health of local food webs. “With this information, we expect to get a pretty good idea of how serious the microplastics problem is here in Georgia,” Brandes said. The team will integrate the entire process into the UGA Marine Extension’s ongoing education programs. They will involve regional educators and their students in both sampling and counting efforts as part of overall marine debris educational programs. Teachers participating in a summer workshop sift through the sand of Tybee Island in search of microplastic particles. The trawls will be conducted with the assistance of visiting school groups, composed of roughly 20 students each. During the trawls, the various species will be identified and counted by the students. In addition, discussions of microplastic pollution and the potential of ingestion by marine life will be incorporated into the year-round education programs at Marine Extension, such as a fish dissection lab, the invertebrate lab and the plankton lab. The researchers also plan to enhance an existing marine debris exhibit in the UGA Aquarium by adding a microplastic component. The UGA Aquarium, UGA Marine Extension and Georgia Sea Grant are all part of the university’s Office of Public Service and Outreach. Skidaway Island, Ga. – University of Georgia researchers are hoping to find a consistent way to record the marine debris—particularly pieces of plastic—crowding Georgia’s beaches as part of an effort to find a solution for the growing problem. Marine debris has been washing up on Georgia beaches and uninhabited islands for years. Combatting the issue starts with figuring out how big it is, and a new two-part study from the UGA Skidaway Institute of Oceanography and Marine Extension published online in the Marine Pollution Bulletin finds that marine debris reporting can improve if it becomes standardized. The problem right now is this: A volunteer group goes out and records the weight or volume of the marine debris collected. However, volunteers don’t often record the specific square feet measured or the contents of the debris. Due to a lack of report standardization, researchers often can’t compare the marine debris, especially plastic fragments, reported by different groups. 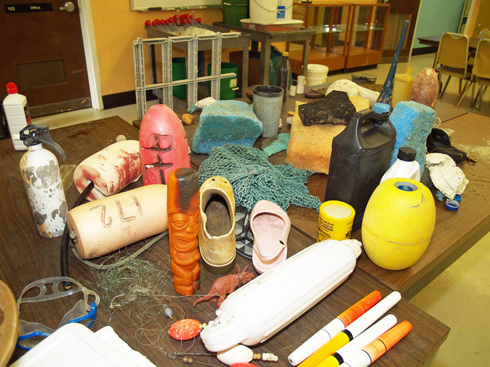 A sample of marine debris collected along the Georgia coast sits on a table at the UGA Skidaway Institute of Oceanography. The study’s lead author Richard F. Lee, professor emeritus with the UGA Skidaway Institute of Oceanography, agrees. The first part of the study gathered debris from 20 sites along Georgia’s coast, including Tybee, Cumberland and Ossabaw islands. The debris was reported from volunteer organizations like Clean Coast, which hold monthly beach and marsh cleanups in Georgia. 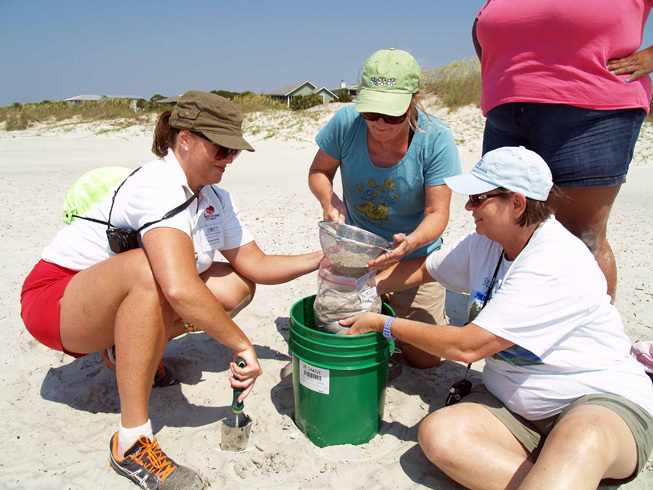 Participants in a July 2014 teacher’s workshop focusing on marine debris sift through the sands of Tybee Island in search of microplastic particles. The total collected debris ranged from 180 to 1,000 kilograms. The levels of plastic debris differed at each site over the course of the study, though plastic was consistently among the mix. Found plastic included plastic bottles, wrappers, food utensils and fragments of fishing gear. Sanders spearheaded the second part of the study, where she and students collected plastic debris from Skidaway and Wassaw islands over a period of two years. For the fieldwork, Sanders and students visited the islands each month. They took inventory of what kinds of plastics were on specific areas of the coast. The students, many of them in middle and high school, came from all over Georgia to assist. As part of Marine Extension, Sanders regularly teaches visiting students about marine life. When students volunteered to clean up, she tried to emphasize the issues surrounding debris. Sanders says that since plastic debris is everywhere on the coast, it has to be addressed and reported efficiently to reduce its effects. The study was supported by the Georgia Department of Natural Resources Coastal Incentive Grant, NOAA Southeast Atlantic Marine Debris Initiative and the NOAA Marine Debris Program. The full article on “The amount and accumulation rate of plastic debris on marshes and beaches on the Georgia coast” is available at www.sciencedirect.com/science/article/pii/S0025326X14008200#.